It’s just 4 years since the iPad first entered our lives and despite the view of some commentators, that sales might only top a couple of million, the product has become a legend and total sales to date far exceed 100 million and are likely to continue to accelerate in the coming years. The device fulfils a role that is far removed from the functionality of the smartphone device or the classic desk-bound computing device. The device is tactile and is as likely to be found on the couch or kitchen bench, as on an office desk. For this reason, the iPad (and the other Android based tablet devices) is in many ways the battle ground for property apps, as property searching is largely a ‘lean-back’ experience undertaken in times of rest when you want to immerse yourself into a world of escapism with dreams of a new home. For these reasons I would contend that the best property iPad app almost bears no relation to the iPhone or smartphone app. They provide platforms for very different use cases. The smartphone is all about proximity based discovery and routing to viewings as well as alerts to new listing - functional activities requiring key information, easily and quickly accessible. The iPad is all about browsing in a mode that the traditional laptop or desktop could never deliver to the needs of the buyer or renter. The experience needs to be more of a magazine experience - rich in imagery and immersive in context. The iPad is an intimate device that is held close and in effect caressed and so the experience of an app needs to bear that in mind. For New Zealanders however I have to sound a note of cautions for the options here are limited and to be honest none of the 3 I have reviewed really deliver to the experience of some of the best in the world and for me some of the best are found in the highly competitive US market with the app from Redfin being a great example. So let me share my thoughts on the 3 options for New Zealanders, from Trade Me Property, Realestate.co.nz and uniquely a real estate company app from Barfoot & Thompson. I propose to deliver this review in the similar manner as a car review, scoring points based on key categories. These categories are ease of use, content, search and overall user experience. In overall terms, all of these apps are easy to use and fairly intuitive. However to start with extra marks go to B&T for the new overlay intro tutorial which in a couple of screens gives you a great overview of the functions so nothing is left to chance. Both B&T & Realestate.co.nz choose to begin the user experience with a map defaulted to your location devoid of any filters. In my view this is the best landing screen for a property app on the iPad. Realestate.co.nz does things slightly better in having a right hand column of listings from the area ranked by latest listed date - a missed opportunity would be the contextual reference numbering which could show the location of these properties on the map. Trade Me on the other hand defaults to a list view of properties ranked by latest listing but based on the whole database of NZ making the initial experience woefully irrelevant as context is everything! To get to the same experience of a local map as the other two apps takes 3 more taps - a tap too far! When selecting a listing from the map to view details, B&T chooses to take you to the listing and ignore the location context of the map, whereas the other two provide a hybrid screen of map and listing details. Here there is a vast difference between Trade Me Property & Realestate.co.nz in terms of the amount of screen space given to the listing vs the map. 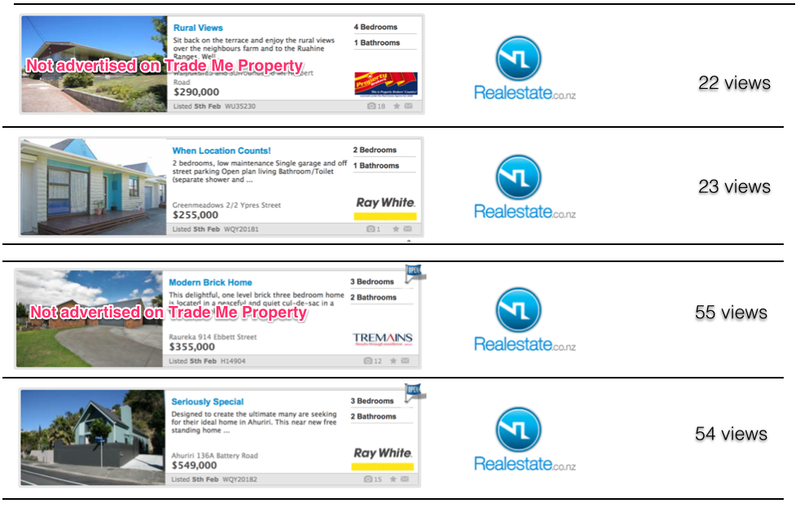 Way too much focus on the map by Realestate.co.nz diminishes the viewing of a listing. When in this mode it takes just a single tap on a listing pin on the Trade Me Property app to shuffle to another listing - very intuitive. Realestate.co.nz makes you work hard with a required 2 taps to get to a new listings. None of the apps provide what I judge to be a logical interactive functionality - that being a map with a list of properties whereby the selection of a property on the list highlights (by changing the colour of the map marker) where it is on the map and visa versa - here's this in action on the Redfin app - not a perfect execution but valuable functionality. The B&T app provides one form of functionality that the other two don't and I love it. It is a flipboard style image viewer which lends itself to the casual, elegant flipping through properties in a magazine style - great execution and a powerful point of difference. Listings are what powers these apps and each have the same core data regarding their portfolio of listings. Clearly in richness of content the B&T app can only showcase their own listings thereby pushing them down the rankings however because they originate the content of the listings they show they are able (or have chosen to develop) functionality that is richer; I speak specifically of videos and floor plans. Trade Me has the most comprehensive portfolio of listing, especially considering the dominance in rental listings the site enjoys as a function of the private landlord market. Talking of rentals, a point of note is the fact that the B&T app does not feature rentals, only property for sale. The most important component of all listings are the photos, this is key whether you are viewing on a handheld device or a laptop, but to fulfil the desire of a lean-back browsing based couch device the iPad has to have stunning images. The raw data of image files for each app is identical (although B&T has the advantage of the original raw image files) but sadly Realestate.co.nz lets itself down by what looks like the use of compressed image files designed to be viewed on an iPhone. The sequence of images and 'blow-ups" below graphically illustrates this. I added this category to make a point. That point is School Zones which is the differentiator between the B&T app and the others. Neither Trade Me Property nor Realestate.co.nz offers any complementary data other than listings. But that is what we want! - I hear you cry! Many of these sets of data are simply not available in NZ or only at prohibitive cost. However the point is valid and I think important. School zones are public data and easily incorporated into an app and yet the two leading players choose to ignore the details. Good on Barfoot's for showing the way. However B&T don't stop there they also have a tab in the listing view that includes the StreetView from Google - beautifully integrated into the full screen view - beautifully executed! The Realestate.co.nz app is the only one of the 3 to use aggregation of listing 'pins' which on the zoom out function reverts to a number to show the total of listings in an area. Trade Me uses red pins which cluster on zoom out until they disappear with a notice instructing you to zoom in - not a very friendly experience. B&T adopt a kind of mid solution - red pins which don't cluster but when you click on them on zoom out show a number of listings for the local area. Only Realestateco.nz uses differentiation in the pin design to highlight 'New' listings, in my view a valuable feature it is the only app allowing you to also filter the search by 'days-on-the-market'. Both B&T and Realestate.co.nz do display 'Open Home' flags on listings with B&T offering an ability to filter the parameter of open homes by 'any time / this week / today / open in next hour' which I find really useful. In terms of search filter the Realestate.co.nz and Trade Me apps rely on the iOS format scroll wheel for price and tick boxes for other criteria. As noted in the review of the Realestate.co.nz iPhone app the somewhat restricted search ranges especially on price and on bedrooms as compared to the website is surprising. B&T adopt sliders for price, bedrooms and bathrooms, something I find difficult from a user functionality perspective as the finger tends to obscure the slider and there are no visual cues to the gradations on the slider. A key part of search on any device is the context of location presented by maps - real estate is always conditional on location and therefore despite the fact that the use of the iPad app may be on the couch the map view is important. Here the 3 apps differ, with in my view Realestate.co.nz taking top honours by using the Google map application layer whereas both B&T and Trade Me Property have defaulted to the Apple Maps layer. This is so evident as a drawback when viewing in Satellite mode - the resolution on the Apple Maps layer is so inferior to the Google Maps layer. These images below show the highest zoom in you can achieve in each app before losing resolution - a vast and significant difference. 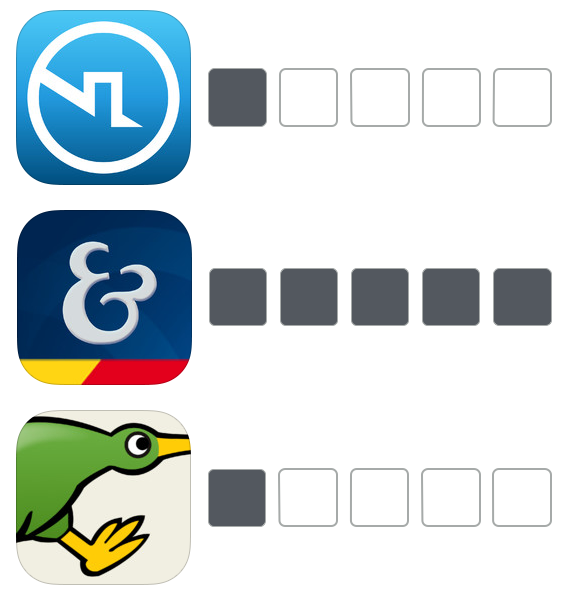 Getting to use these apps begins to show their respective strengths and weaknesses. In reference to my earlier comments, in my view Realestate.co.nz is the weakest, as simply this iPad app is the iPhone app adjusted to fit the format of the iPad, and sadly as noted earlier the issues with screen resolution makes it the least likely app for 'lean-back' browsing. Too often the majority of the screen is taken up with the map view which does not interact with the property or list view in an intuitive manner. It does have the value of the higher resolution satellite imagery but this is not enough to make for the shortfalls. Trade Me Property delivers a better solution, however given the resources and capability from a company of their size and knowing how critical the property sector is to the overall performance and long term value of this publicly listed company, I would have to say the app delivers at the lower end of expectations. Too much focus remains driven on the user experience of the web and too little time seems to have been spent on experiencing other property apps and other magazine apps in general as a benchmarking exercise. The winner by a wide margin in my view is the Barfoot & Thompson app. A well executed iPad app that has been thought through and tested to deliver an experience that I would enjoy using - a credit to the marketing and tech team there. The saddest conclusion though is that the best app is at best a great platform which will be so seldom used as fundamentally who will ever use it? - it showcases just Barfoot & Thompson listings - sure that is close on 4 out of every 10 listings in Auckland, but what use is that? Given the clear advantage that the app delivers if I was in the role at Barfoot & Thompson I would make a smart decision. I would as a 22.22% shareholder in Realestate.co.nz* license the app to Realestate.co.nz and thereby benefit doubly - prove the credibility of the technical and marketing prowess of the team and at the same time earn a license fee whilst at the same time deliver to Realestate.co.nz as a championing industry owned website to challenge Trade Me a superior app to the current one - food for though! My recent article on the state of the online property space here in NZ has raised some interest in the media - clearly the issue is topical, but more importantly there is much at stake. The potential value at play here is anywhere between $100m and $1,400m per annum. The former amount being the total expenditure by the real estate industry on marketing; the latter being the total value of the commission based services charged by the real estate industry upon its clients - the sellers of residential property. Clearly Trade Me is not intending to disrupt the whole industry but equally the real estate industry feels threatened and so their value is under threat! For Trade Me the goal of the lion’s share of the $100m a year in property marketing is critical. The most recent estimate would put their annual revenue from real estate (licensed agents, excluding private sales) at $15m, this would more than double if not triple if they can secure their new pricing structure. Trade Me is a listed public company and its ambition and its shareholder expectation is to dynamic growth and from that a healthy cash-flow based on an earnings-to-sales rations of over 75%. To achieve this, as they have said, requires a growth in its best performing sector - classifides of which property is the key. For Realestate.co.nz its goal is to block the Trade Me ambition and in so doing wrestle control of the digital advertising platform from Trade Me so as to provide its shareholders (The Real Estate Institute of NZ (REINZ) and the 5 largest real estate companies) with a cost effective marketing solution; whilst at the same time transition advertising from print to online. I very much appreciated the very detailed response to my recent article from Jimmy McGee, the Head of Commercial at Trade Me, who has been holding the reins of Trade Me Property awaiting the start of Nigel Jeffries who steps into the role as Head of Property shortly. His response can be read in full in the comments to the last article. I have chosen to dissect the complete response and in so doing respond specifically to all of his comments, somewhat in the form of a Q&A. I would concur Trade Me will remain an obvious marketing option for agents and vendors. More people, more of the time use the web to search and research real estate. In many countries property websites are in the top 5 of all trafficked sites (UK & Australia) Trade Me is certainly a Top 10 website in NZ so it is logical all agents would see it as a valid option. Anecdotal evidence from agents - in fact almost universal evidence from agents over the past few years from my experience is that Trade Me Property delivers far more buyer leads than any other medium (not just than any other website). This statistic is not shared lightly and is massive. 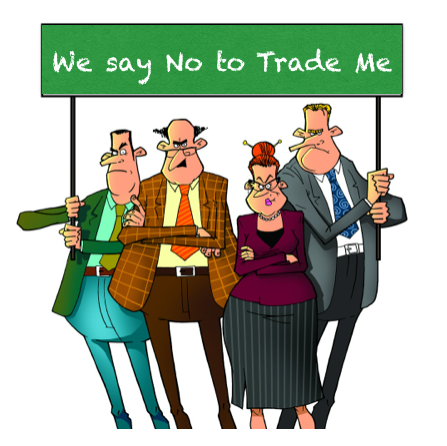 Trade Me is a publicly listed company and as such has to be carefully and prudent when making any claim - to claim then that a competitor achieves a level of just 2% of all property buyers (in a survey) as compared to Trade Me Property at around 50% is not done rashly or without careful consideration. 3. We’re not resting on our laurels. We understand we need to keep working hard to demonstrate the value and effectiveness of Trade Me Property as a marketing option for agents and their vendors – it’s not something we take for granted. As we’ve always said: “You should only use TMP if it helps you sell houses.” We’ve recently released aerial boundary images, will show school zones soon also. Plus well have map-based search for desktop out in a month or so. And last but not least, we’ve got some exciting stuff in store for our mobile products. Now this is where I think that Trade Me Property has been deficient for a considerable amount of time. They have not been a significant innovator. Even today the user experience of Trade Me is of a single unified platform built around auctioning household items which leaves the properties section woefully underserved as compared to other property portals overseas. I would have to say Realestate.co.nz has not been that innovative, however their latest version of their iOS app is a good step forward, despite the stumble! Trade Me Property has been weak in delivering a credible mobile experience - certainly as they cite later in their response, many people may well use the general Trade Me mobile app for property searching but it is not a step forward in property searching merely a mobile version of the web search. TMP is designed to empower consumers and puts private listings and agent listings on a level playing field. TMP is independent, not industry-centric, and aims to provide buyers with as much transparent information as possible. We believe that over the long-term, loyalty from buyers and sellers will come via TMP being an effective and good value marketing option, and providing users with the best experience. I would agree there is a sense of Back to the Future here. Back in 2008/9 there was a stand-off by the industry resisting the desire to have their listings on Trade Me. In 2006 only around 30% of licensed listings were on Trade Me. By 2008 that had risen to 65%, but some of the major groups held out, most notable Harcourts. By 2009 all groups were on Trade Me Property, not for the reason of negotiated buying rates, but simply because vendors demanded agents put their property on the site, these agents demanded that the business owners agree to list on Trade Me. Today we have the opposite effect of business owners telling agents to tell vendors that they don’t want to be on Trade Me - because they don’t want to pay $159 + GST to market their clients property! I would agree Trade Me has always been about empowering consumers. However it has also always been about creating value and enhanced shareholder wealth. 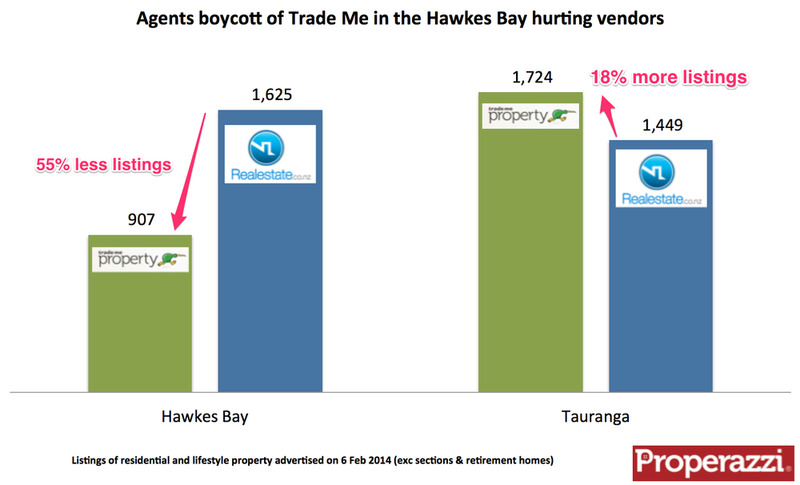 Trade Me is independent as much as Fletcher Building is independent or any other publicly listed company is. It's a publicly listed company with shareholders and a board of directors representing those shareholders who hold the executive team to account to enhance the value of the company. It's there to make money - Trade Me is not a charity. I think the comment “not industry-centric” may have been a mistake, for a property portal to be successful, it has to be customer centric where the customer in this case is the agent. Not the consumer, and thereby the business has to be 'industry-centric'. I think in someways this is at its core, one of the issues that has caused the problems in Trade Me Property this year. It’s fair to say we’ve got some concerns about the flyer and the overall impression it creates that the industry-owned site has both more house listings and more traffic than other websites. We think this is off the mark. The nationwide picture is distorted by the actions of some agents who withdrew listings in Hawkes Bay & Hamilton. TMP still has more residential for sale listings in a bunch of areas, including Auckland, Wellington & Canterbury. This analysis includes lifestyle listings, where we have 1,000 fewer listings than RE. We’ve probably lost a bit of ground there to the way we’ve treated lifestyle listings, rather than agent backlash. We currently exclude lifestyle from residential search, which we’re looking to change soon. We expect this will make it a far more compelling proposition for agents and vendors of lifestyle properties. Whilst Trade Me might have concerns over the flyer, my analysis shows the statements made have validity. At this time Realestate.co.nz does have more listings. I have gone back to examine the listings data as at the 6th April utilising the same methodology to compare each category of listing on both sites across the main metro centres. Auckland sees Trade Me Property with 6% more listings overall, however when stripping out an estimation of privately listed properties to examine side-by-side licensed real estate listings Realestate.co.nz has 479 more listings - an advantage of 5%. In Wellington the two websites classify the region geographically using differing boundaries, for the sake of comparison I have excluded from the Trade Me Property listing the districts of Carterton, Masterton and South Wairarapa which are not included in the Realestate boundary of Wellington, thereby as best as can be evaluated the listings data is like-for-like. Wellington sees Trade Me Property with just 1% more listings overall, however when stripping out an estimation of privately listed properties to examine side-by-side licensed real estate listings Realestate.co.nz has 346 more listings - an advantage of 12%. Canterbury sees Trade Me Property with 11% more listings overall, however when stripping out an estimation of privately listed properties to examine side-by-side licensed real estate listings realestate.co.nz has just 92 more listings - an advantage of 3%. So it is fair to say that in the major metro regions of NZ Trade Me Property have more listings, however from a consumer standpoint to be able to examine the true comprehensive picture of all property advertised for sale you would need to use both websites. As the analysis includes Lifestyle properties the comments about the display structure of these listings on the Trade Me Property site is more an internal issue for the company and its design team. Audience: Trade Me Property’s audience (average daily unique browsers during March 2014) as independently measured by Nielsen, is more than 3x the audience of any other property website in NZ. Looking at data from the past 7 months, Trade Me Property’s monthly audience has included an additional 76,000 and 92,000 more browsers each month than any other competitor site. According to Nielsen, 77% of visitors to TMP didn’t visit RE (Feb ’14, NetRatings, total traffic). I am grateful for the exact Nielsen data provided in the response. I have mapped the data and added it to the chart Trade Me Property also presents on its agent home page which shows data from April 2012 to March 2013. As can be seen the differential between Trade Me Property and realestate.co.nz is significant. Trade Me Property has 3 times the average daily traffic but a year ago the differential was 5 times and 2 years ago the differential was 6 times. In March realestate.co.nz average daily visitors were up 95% as compared to a year ago - Trade Me Property average daily visitors up just 8%. Some agents are disregarding their vendors’ best interests. Agents in some parts of the country are taking advantage of their role as a trusted advisor and using vendors as pawns in a real estate industry power play. Not having listings on Trade Me Property means less people will see the house for sale which means the vendor is less likely to sell, or get the best price. We don’t believe these realtors have their clients’ best interests in mind as their clients’ properties are not being seen on the country’s best property marketing channel. We think agents should do what is best for their vendor, and that would generally include using Trade Me Property as a way to get properties in front of the largest audience and helping them sell more property. I believe some of these comments are valid. Given the significantly larger audience to Trade Me Property and the data on those who visit Trade Me Property and not Realestate.co.nz then an agent not advertising a clients property on Trade Me Property is disregarding their clients best interest. Further this action of refusing to advertise or telling clients that they don’t recommend Trade Me Property is using clients as pawns in a power play that is out of all proportion - a fee of $159 + GST is the cheapest form of advertising. It's time the agents woke up to demonstrating their role and either pay it out of their commission or re-charge it. Stating that not advertising on Trade Me Property means less people will see the house for sale which means the vendor is less likely to sell, or get the best price, is a serious stretch. This can never be proved and as I have written recently property sales never have a ‘control’ environment. We understand why you’ve compared the iPhone app for TMP and RE, but it’s only part of the picture. This is because as well as the TMP app, heaps of New Zealanders use the TM app to browse for property on their iPhones. 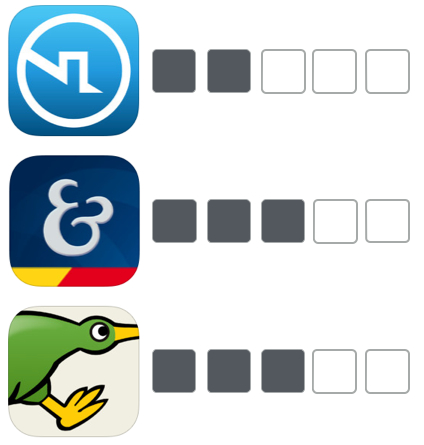 Nielsen’s research has also found that more people downloaded or used the Trade Me app to search for property than the Realestate.co.nz app. Whilst the fact that ‘heaps’ of New Zealanders may well use the standard Trade Me app to browse property on an iPhone, that experience is not comparable to the inherent value of a mobile app for property which is what both the Trade Me Property app and Realestate.co.nz app deliver - the battle grown is now, and in the future the mobile space / app environment. If Trade Me Property want to win this battle they need to avoid relying on users engaging with Property on their main app. My advice would be to exclude property listings on the main app and create a mindset change that will get those users to download the property app. There has not been much commentary for well over a month on the tension between Trade Me Property and the real estate industry - up in arms over the new pricing structure. That was until this marketing flyer hit the digital wires today. Proclaiming that traffic and activity on the industry owned website of Realestate.co.nz has "gone through the roof". These are some significant stats and naturally I am always keen to look into the numbers, where I can, to provide what I see as valuable insight. Based on my own analysis as of today (2nd April) this is most definitely true. Not just more, but significantly more! For the past 3 years at least Trade Me Property has had a subscriber base at least equal to Realestate.co.nz or close enough to make little difference and so from the perspective of licensed agents the two sites have been line-ball. On top of this Trade Me has an additional stock of listings from private sellers which on average have amounted to around 16% of the Trade Me listings which generally means Trade Me has around 18% to 19% more listings than Realestate.co.nz. As of today that advantage to Trade Me has disappeared and Realestate.co.nz not only has more listings (a margin of 4%) but by applying an estimation factor for private listing, Realestate.co.nz has considerably more licensed agent listings (a margin of 18%). In seeing this significant advantage to Realestate.co.nz I was naturally drawn to look at the hot-spot of the Hawkes Bay where the boycott against Trade Me continues and has seen a large proportion of agents listings only appearing on Realestate.co.nz. The actual make up of listings on both sites as of today in the Hawkes Bay are as follows. This is staggering. In the Hawkes Bay Trade Me Property is only displaying 428 houses being marketed by real estate agents for sale as compared to 1,103 houses on Realestate.co.nz - I know where I would be looking for property for sale for sure in this area of the country! The marketing flyer speaks to a lift of 30% in traffic over the past 6 months quoting Nielsen average daily unique browsers, certainly a very credible source of data. Not having access to Nielsen data I turned to a source I use quite a bit these days Similar Web. This service provides estimates of website traffic, by no means as accurate as Nielsen of Google Analytics but useful as far as seeing trends. The trend since the start of the year has been of a significant growth backing up the more credible Nielsen stats. 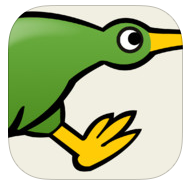 The Realestate.co.nz iPhone app was the first mobile property app in NZ, leading Trade Me Property by 18 months. Since that launch in late 2010 the app has been downloaded more than 200,000 times and rightfully can claim the mantle of the No. 1 property app in NZ. The marketing flyer speaks to the download rank as the demonstration of leadership quoting "iTunes & app annie download rank of property apps in NZ". The source of this ranking data is App Annie which tracks the ranking of all iOS and Android apps. For the sake of relevance I have only examined the iPhone app download ranking as Trade Me Property does not have an Android app and the Realestate.co.nz iPad app has only just been launched. The charts below show the past 12 months for the Trade Me Property iPhone app and the Realestate.co.nz iPhone app. The Realestate.co.nz app is being downloaded at rate which consistently places it at around the 320th most popular app in NZ, whereas Trade Me Property app is further down the rankings at an average of 500th place. These collective stats do provide (not that I was sceptical) a very clear demonstration that the battle for supremacy in the property portal space in NZ is actually not that clear cut and certainly in the past 4 months things have begin to change. I am not saying that Trade Me is wounded, but at the same time their is a clear demonstration that Realestate.co.nz is gaining. They do however need to make sure they attend to the detail, like for instance their version 2.0 of their iPhone app which was poorly tested before bugs were discovered which could have seriously undermined their credibility in that key space. Trade Me Property recently published an interesting infographic detailing some key statistics on their website usage by home buyers. I thought the data worthy of highlighting and reviewing. The figure which, whilst not central to the stats on property is always somewhat staggering is that Trade Me has over 3.2 million accounts and over 730,000 daily visitors across its site. There would be no other media save only for the gorilla-like Facebook that attracts such an audience or holds such an account base of NZ’ers. Certainly no traditional media company comes anywhere close to that which makes it all the more surprising that Fairfax, having shown the smarts to acquire the company then made the decision to divest. Anyway back to property. Trade Me Property now attracts over 120,000 visitors a day which represents 4 times as many buyers as any other site (clearly referencing the 2nd placed site of realestate.co.nz). This level of daily visitors is staggering for the reality is that if you added together all the active property buyers and sellers in NZ to the total of all the agents, to all of those looking to rent property with all investors and then add commercial property agents and their clients, in total you might get somewhere close to a third of that number. That means that right or wrong the appeal of viewing property is a national pastime. However whilst we often label ourselves as a nation of property fanatics I can tell you that with my experience of similar property portals around the world we are not that different. In fact in Australia the ratio of visitors to population on the leading site realestate.com.au is higher than Trade Me Property attains and in the UK RIghtmove the leader there is the 6th most visited website in the UK across all categories. Not only does Trade Me achieve this enormous visitor traffic on a daily basis they also manage to engage those visitors for longer than any other property site. This results in the staggering fact that 8 out of 10 of all time spent by people on property website s in NZ is spent viewing property on Trade Me. Added to these hard statistics sourced from market analysts Nielsen, are some new data from a recent survey the company undertook from a survey of over 600 qualified buyers. The research shows that more than half of all buyers found the property they bought on Trade Me with 63% of buyers rating Trade Me as their #1 place to find property. Clearly Trade Me has the lions share of eyeballs and they are leveraging this to seek to deliver every growing financial returns which are so required of a publicly listed company. The question and challenge for the company is more by how much can Trade Me can grow its Property division. That is the challenge for the new leader of that business when they are appointed.